PLANO, TX--(Marketwire - January 24, 2008) - Construction has begun on a retail center designed to provide North Dallas residents a distinctive blend of shopping and dining experiences with office space and a boutique hotel, featuring a mix of national and local retailers. The Ainbinder Company is creating 550,000 square feet of combination retail, commercial and hospitality offerings on a 35-acre site bordering State Highway 121 and Parkwood Boulevard in the burgeoning Plano/Frisco area just north of Dallas. Already, The Container Store has signed on to christen the project's first phase, with a planned opening in June 2008, according to Michael Ainbinder, Chairman and CEO of The Ainbinder Company. 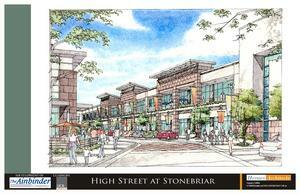 "Lease negotiations are underway with several restaurants and retailers filling out the initial phase," says Ainbinder. "It's an outstanding site located in a very strong trade area with a substantial residential and daytime office population," explains Ainbinder. "This property is a prime location for a Class A specialty/lifestyle retail center with additional mixed-use components such as office space, a boutique hotel and, potentially, urban residential lofts." The project's second phase will feature 250,000 square feet of retail and 100,000 square feet of office space -- a design intended to create a dynamic atmosphere that merges work and play, according to Bart Duckworth, President of The Ainbinder Company. "Our goal is to build a center with its own distinct personality and environment, a place that offers a diverse and engaging shopping and dining experience," says Duckworth. To that end, Duckworth says they plan to lease 60 to 70 percent of the project to national retailers and the remainder to a varied mix of local and regional retailers and restaurants. "Architecturally, we plan to create an inviting, urban village; it's not going to be just another retail strip center," Duckworth says. UCR Urban, the specialty retail division of United Commercial Realty, the largest real estate services firm in Texas, is heading up the leasing team for the Ainbinder project. "The center is being created with a highly distinguishable point of difference for the female patrons and retailers trading in the Stonebriar Mall catchment area," says UCR founder Mickey Ashmore. "Our goal is to provide a collection of retailers and restaurants new to the trade area in a highly accessible, convenient and exhilarating environment -- a respite to the retail clutter north of 121 and Stonebriar Mall. "I would suggest that the quality will be on par with Kierland Commons in Phoenix, AZ and the more organic Knox Street in Dallas," Ashmore says. "North Texas contemporary elegance" is the description Duckworth has coined to describe the center's architecture, though plans are still being developed. "It's going to be a place that's interesting and comfortable," Duckworth explains. "People are going to walk this center." Leasing will likely bring many well known national retailers to the area, many of which already have Dallas-area locations but have yet to find the right spot in Plano, according to Ainbinder. Some of the country's largest and most-recognized companies call Plano home, and many corporate campuses surround the project. National firms headquartered in Plano include: Frito-Lay, JC Penney, Cadbury Schweppes Americas Beverages (formerly Dr Pepper/Seven Up, Inc.), Electronic Data Systems (EDS), Metromedia Restaurant Group (Bennigan's, Steak & Ale), Countrywide Financial and Triad Hospitals. Other companies with a significant Plano presence include Raytheon, Texas Instruments, Alcatel-Lucent and Ericsson. Six of The Container Store's 38 locations are in the Dallas metropolitan area. This will be the retailer's first site in Plano. Valerie Richardson, Vice President of Real Estate for The Container Store, represented The Container Store while Brian Glaser of The Weitzman Group represented The Ainbinder Company in this lease. Amegy Bank of Texas, with $10 billion in assets, provided the acquisition and construction loan for the development. Equity capital was provided by Inland American Real Estate Investment Trust, the fifth largest retail center owner in North America, according to Retail Traffic magazine. The UCR Urban leasing team includes Mickey Ashmore, Michael Nagy, Bob Nagy and Ashley Allen. Other project participants include Kimley-Horn, civil engineering services; Hermes Architects, architectural design; and EMJ Corporation, general contractor. The Ainbinder Company is a Houston-based real estate firm specializing in the acquisition, development and redevelopment of retail real estate throughout the United States, where the firm has developed over 2 million square feet of shopping centers. This will be The Ainbinder Company's second development in the Dallas-Fort Worth metroplex, having previously developed a 150,000 square-foot center in Grapevine, Texas. The Ainbinder Company has successfully conducted transactions with retailers such as Wal-Mart, Sears, Home Depot, Best Buy, Walgreens, CVS Pharmacy, HEB Grocery Co., Border's Books, Kroger, Kmart, Barnes & Noble, T.J. Maxx, OfficeMax, Office Depot, Staples, Sam's Club, Just for Feet, Petco, Super Crown Books, Academy Sports & Outdoors, Gander Mountain Sports, Albertson's, LA Fitness, Dollar Tree, Fleming's Prime Steakhouse, Landry's Restaurants, Whataburger, and Chick-Fil-A. For more information, visit The Ainbinder Company online at http://www.ainbinder.com/.